I've been working on this one for a while and I'm delighted that it is available from today at the Amazon Kindle store. The pocket notebook revival has begun. 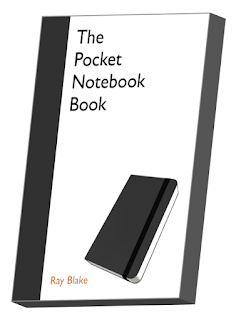 Professional men and women, teens, homemakers and hobbyists are all rediscovering the simple but powerful tool that is the pocket notebook. They are learning the many, many small and big ways that those little books could make their lives easier and better. - Do you own a pocket notebook - or many? - Are you curious as to whether you are making the most of it? - Would you like to see the full range of possibilities that this little book presents? - Or are you currently a novice notebook user? - Are you interested in learning why you should adopt the notebook habit, what you can achieve and how you might make a start? Millions of notebooks are being sold every year now. The industry many wrote off as a dying relic is one of the boom businesses of the twenty-first century. Purchasers are buying their first notebook, often unsure of what to write in it or how to use it for best advantage. Whatever type of user you are, whether you are just buying your first pocket notebook or whether you are an experienced user with drawers full of filled books, there is plenty to learn from this book. The book is available for a reasonable price. To see it at your local Amazon site in your own currency click here.